Left to right: Jessica LaFever, Lauren Meyer, Edward Clark. Photo courtesy David Allen. Buried in the file drawer of Broadway history is the 1997 musical Side Show, based on the lives of conjoined twins Daisy and Violet Hilton. 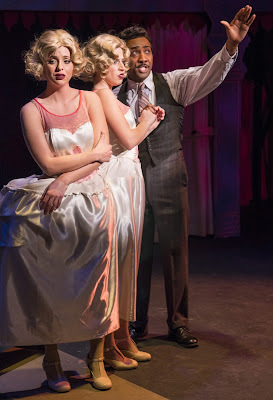 Despite the high-concept premise, Side Show is a surprisingly grounded exploration of disability, show business, and heartbreak packaged within complex musical numbers written by Henry Krieger, also responsible for the smash hit Dreamgirls. Foothill Music Theatre’s adaptation is an excellent performance of one of the American theatre’s forgotten gems. Musically, Side Show is complex on two different levels. On the micro level sits Henry Krieger’s fast, dense lyrics, displaying intricacy in their construction as much as they make you hum along. At the macro level, the placement of the songs is unique; unlike most musicals, where the numbers are placed in a neat little sequence, many of Side Show’s songs are folded into one another like the Arabian Nights. This unusual structure is enough to pique the interest of even the most jaded theatre attendee. At the core of the show are the aforementioned twins, played by Jessica LaFever (Daisy) and Lauren Meyer (Violet). Violet and Daisy have different goals – Daisy wants worldwide fame, while Violet wants a quiet home life – but they are refreshingly supportive of each other. Despite their bizarre circumstances, they have the least dysfunctional relationship of anyone in the play, and LaFever and Meyer act, with all the petty squabbling it implies, as true sisters. The actors their behavior – in relative privacy, their extroverted/introverted dichotomy is more obvious, while in their side show and vaudeville performances, they act almost completely in sync. The rest of the cast matches LaFever and Meyers’ acting talent. Buddy (Tarif Pappu) plays Violet’s love interest, a choreographer who wants the twins to make it big as much as he wants to shine on stage himself. Pappu charges the role with the innocence and kindness it requires, gradually changing his pity for affection over the course of the play. Terry (Sean Okuniewicz) is the most business-minded of the main cast, with Okuniewicz obscuring whether he’s helping the Hiltons for the money or out of a genuine sense of care. The most complex character, narratively speaking, is Jake (Edward Clark), the former sideshow cannibal who follows the twins through their show business career; his protective nature and cautiousness about anything new, combined with Clark’s incredible singing voice, creates an unforgettable character. Side Show at Foothill has many excellent attributes, but perhaps the best is that I genuinely did not know what was going to happen next. The intriguing plot and musical structure, combined with the acting company’s heartfelt performances and excellent singing, provokes a genuine sense of suspense. Side Show is highly recommended for anyone who loves musicals and wants to see something a little bit different. Side Show is not to be missed.